Natural pearls are accidents of nature. They form when an irritant such as a speck of sand or a parasite enters the tissue of a mollusk. The oyster responds by secreting layers of calcium carbonate called nacre around the irritant, in an effort to protect itself. Over several years and millions of layers of nacre later a natural pearl is formed. This whole process occurs in nature with no intervention from human beings. This is the essence of the difference between natural and cultured pearls. Before the advent of pearl culturing, natural pearls were the only pearls available for use and they were farmed across the globe. Today, natural pearls are extremely rare and they make an insignificant proportion of world wide pearl production. This is due to over fishing of oysters, pollution, drilling and changes in water temperature that have affected the delicate population of natural pearl oysters. Most of today’s important and high quality natural pearls are in collections and estates both private and public. They have been meticulously collected over decades by pearl collectors, royalty, museums and governments to preserve their undeniable value. The overwhelming majority of pearls you see in jewelry today would be cultured pearls, with natural pearls making up a very small minority. A mabe pearl is an assembled blister pearl, i.e. a pearl that has been attached to a shell. The blister pearl is a hemispherical shaped pearl grown against the inside of the oyster’s shell, rather then within its tissue. Maybe pearls are frequently produced within saltwater oysters in the regions of Japan, Indonesia, Australia and French Polynesia. They come in colors ranging from light pinks to white and bluish shades. The unique nacre of mabe pearls results in beautiful colors and mirror like luster. The culturing process is the same and the only difference being the nucleus is hemispherical, rather then round and is inserted against the oyster’s shell rather then within its tissue. The blister pearl then forms with a flat back. After the blister pearl has formed, it is cut out of the shell and the nucleus is removed and replaced with a resin. The back of the blister pearl is then capped with a piece of mother of pearl to transform it into a mabe pearl. Even today, mabe pearls remain a niche item, but offer a refreshing alternative to round pearls. Often set in earrings, pendants and rings that highlight their beautiful hemispherical front and conceal the flat back. 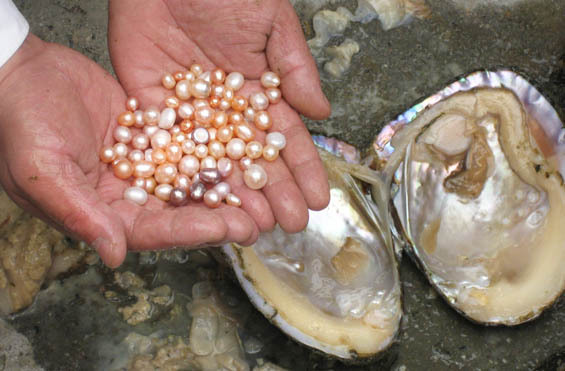 Akoya pearls are also cultivated in China, using the Pinctada fucata chemnitzii oysters. Many of the inherent characteristics of Chinese Akoya pearls are similar to those of Japanese Akoya pearls. Yet, Chinese Akoya pearls have not been able to match the extremely high levels of luster that is commonly seen in Japanese Akoya pearls. This results in Chinese Akoya pearls being frequently less expensive then Japanese Akoya pearls, among other reasons. Keshi pearls are a type of pearl that are formed by accident as a by-product of the pearl culturing process. Keshi meaning “poppy seed” in Japanese is so named because of the generally small size of these pearls. They do not contain a bead at the center, are all nacre and can be either saltwater or freshwater pearls. The lack of a nucleus to guide the pearl also results in shapes not commonly seen in cultured pearls. In addition, keshi comes in a wide variety of colors, making them attractive to set in unique jewelry pieces. Most importantly, the all nacre composition of keshi pearls, gives them an extremely lustrous surface and this is their inherent beauty. In fact, many keshi pearls exceed the value of cultured pearls due to their higher luster and surface quality. Many people confuse keshi pearls for natural pearls, which they are not. This is because keshi pearls are a by-product of the culturing process and not a natural occurrence. Today, keshi pearls are quite rare, and especially ones that exhibit high levels of luster along with unique colors and shaped are highly valuable.